Contributed by Kathy Flaxman: A beautiful kitchen is the centerpiece of a beautiful home and while clinical precision can be useful in food preparation, the element of warmth in materials and design can enhance the space beyond the scientific measuring in say, baking. The personal, the love of cooking shines in a great kitchen: think pinch of salt tossed into that mélange of a stew, hands wiped on an apron. The Cabbagetown kitchen of David Swain and Janet Brown perfectly reflects this happy mix, with gleaming quartz countertops and white pantries alongside the living warmth of rift cut walnut, where the beauty of the grain is fully revealed. This kitchen’s blend is mirrored by the felicitous partnership in cuisine of David and Janet. David is the master chef while sous chef Janet happily takes care of shopping, chopping AND clean up. When David serves up a noodle dish featuring feta cheese, currants and tomatoes, Janet will have done the legwork, making sure everything from the pasta to the cheese is at the ready. 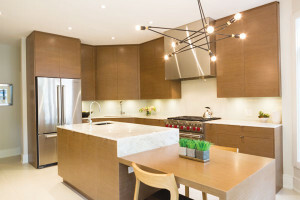 Both enjoy their roles and everything comes together in an outstanding room, completed this spring by Weenen General Contracting Limited “The kitchen is beautiful,” Janet says. “It was very important to me that the material be wood, which has warmth and texture.” David concurs and adds, “I wanted to be sure the kitchen was really efficient in terms of storage and prep space relative to the actual cooking. Also the design means that when I am cooking others can join me, rather than me being isolated.” “The kitchen is very modern, with flat doors and hidden pulls but the walnut gives it an extra dimension,” Frank Di Lucia of Weenen General Contracting Limited notes. “Cabbagetown has wonderful restaurants but in kitchens like this, eating at home can be special too,” he says.